It's a truth universally acknowledged that stained glass is an art form. The stained glass artist uses color, design, meaning, expression, technique…the same qualities used by quilters, stitchers, weavers and other textile artists. Reproducing stained glass ideas in fiber seems like a natural marriage, and it's the subject of the newest quilting book from C&T Publishing and Allie Aller. Allie is the friend we all need—kind, brilliant, funny, creative, warm, encouraging, champion, food lover, family focused, teacher, supporter. With her quilt books, you have her at arm's length. We met Allie years ago at Quilt Market through her gorgeous crazy quilt work. 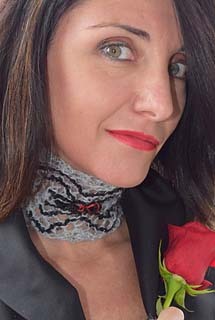 She has created and taught stunning design work using Kreinik threads for embroidery on quilts, inspiring us and thousands of quilters to explore threads, stitches and techniques. For quilters, Allie's newest book, "Stained Glass Quilts Reminagined," will educate and inspire. Why? It pushes the boundaries of what you thought stained glass quilts could be, teaches you fresh ideas, and shows you how to create your own patterns. "Many areas of design can lend themselves to stained glass quilt work," Allie says. "If you think of stained glass quilting as "outlined" art, any design based on simple line drawings or shapes can be transformed into a pattern." Imagine the possibilities: making custom, personalized designs for family, church, community centers, schools, etc. These quilts by nature are not heavily embellished, but there are ways to add depth and dimension through outlining options. She uses Kreinik 1/14" Ribbon—our widest metallic—to create gold leading in the "Windy Sunshine" quilt, for instance. The metallic is a simple update that transforms the design from "lovely!" to "Oh wow!" As Allie notes, "Those outlines don't always have to be black." And that is one of the best messages of the book: you don't have to do things the way they always been done. Take a common theme, classic motif, or age-old design and explore. Try a variety of materials, explore different techniques, break out of the box. Whether you're creating in glass, fabric or threads, expanding you're artistic endeavors will free your imagination. That is what creativity is all about. Designs copyright © 2017 by Allie Aller from the book Allie Aller's Stained Glass Quilts Reimagined from C&T Publishing, Inc.
Thousands of clever string art ideas show up on Pinterest an DIY websites for a good reason: string art is fun. Consider the benefits: creative, easy, no counting/charting/sewing, colorful, and highly personal. You can create string art out of inspirational words, state and country shapes, or symbols that mean something to you. 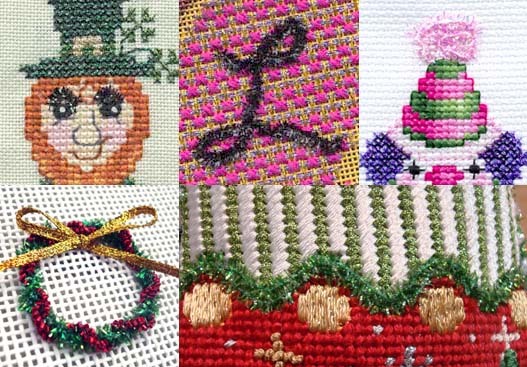 It's fiber art for all ages, all skill levels—even fun for group events and get-togethers. For all these reasons, we are excited to announce a string art class at the Kreinik factory outlet store in Parkersburg, West Virginia, on Saturday, March 4, 2017. 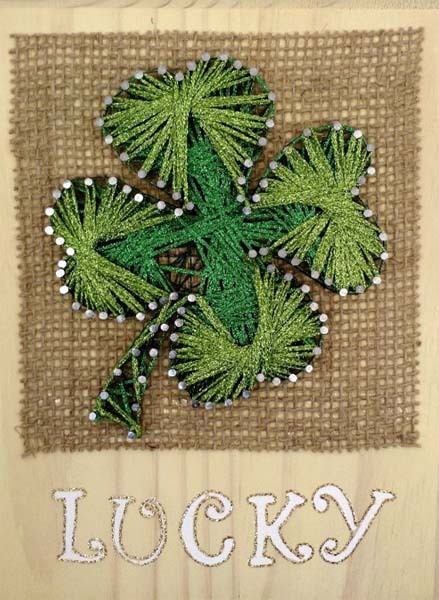 Create some "luck" with a fun, easy four-leaf-clover string art project. Learn techniques and play with bright sparkling string. Make it your own with different wood and string options. If you remember string art in the 1960s and 70s, embrace the new take on this creative, expressive craft. If you're young, getting your first home, apartment, or dorm room and want to create something meaningful, you will love string art. Just think of all the fun designs you can create with colorful fibers like Kreinik metallic and glow-in-the-dark threads. 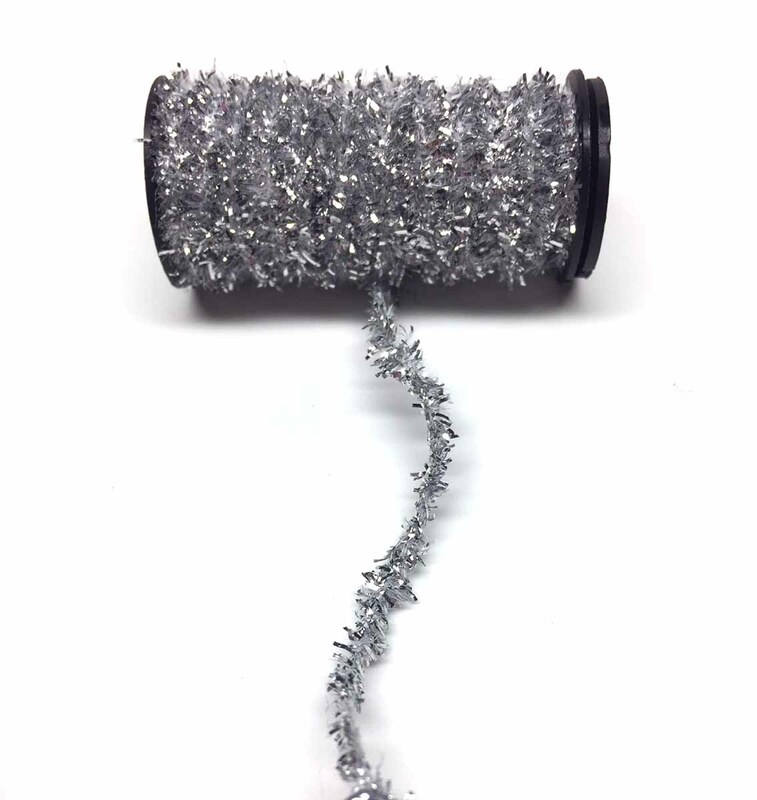 Quick: name five things that are fuzzy (bonus points for fuzzy metallic things). How about: garland on Christmas trees, legs on spiders, flower centers, bushy eyebrows, other, ahem, hairy things, peaches, caterpillars, lots of bugs actually, baby chicks, moldy cheese, your brain after a long weekend. How many could you list? Nature and life itself are full of texture. It makes things visually interesting and tactile. You can recreate the fuzzy factor of true life objects with Kreinik's Micro Ice Chenille in your favorite hobby: needlepoint, cross stitch, embroidery, fly fishing, crochet, knitting, weaving. It adds whimsy, dimension, texture, and just plain visual interest to a design. The line includes basic shades like black, pearl, peacock, green, pink, yellow and more. We just added four colors—and three are going to be perfect for your next Christmas Project. What is Micro Ice Chenille and where can you use it? Now that the Major Football Game is over, we move on to celebrate the next holiday: National Inventor's Day! It's this week, February 11. Time to honor creative people for enabling us to do things like zip up a jacket, ride an elevator, turn on a light, microwave lunch, play with bubble wrap, and write with a pen. "Many inventors go their whole life without recognition for their creation while others are household names," cites www.nationaldaycalendar.com. "Nearly everything around us is the result of someone tinkering in their garage, laboratory or basement trying to find a solution to a problem." Yes, the creator of Kreinik threads for cross stitch, needlepoint, crochet, knitting, weaving, crafting and fly fishing invented many things during his lifetime of engineering. He holds the patent for dustless and instant-igniting charcoal. He worked on textiles for submariners and polar explorers, on zippers, buttons and fastener technology (like the D ring used by millions today). We asked son Doug Kreinik to name a few of Jerry's inventions: "He worked on knitted paper fabric for dresses, foam plastic furniture, resins for table top creations using fabric inserts, many jigs for lean manufacturing, rain proof fabrics, nylon evenweave fabric for needlepoint inserts…" And the list goes on. A stitcher can use either one of these unique tools to help guide threads into place. The result? Your stitching will look more beautiful. A kind of needle with a large eye designed for threading tape, cording, or ribbon through something. Back in the olden days when drawstrings were main fasteners, these were pretty useful for keeping yourself together. If you're cord has ever retreated back into the waistband of your sweatpants or hood of your jacket, you know how annoying that can be. A Bodkin is kind of like the safety pin you use to pull the end back out. There are several types of Bodkins. Kreinik's version is flat and has two eyes (a large square eye and a long slot) for threading different types of materials. Sharper-point Bodkins are used in fly fishing for more precise placement of fibers (in making flies). WHAT'S A BENT WEAVER'S NEEDLE? 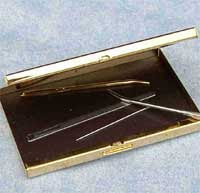 A Bent Weaver's Needle is a large, thick Tapestry needle, about three inches long, with a big eye and blunt, bent tip. Traditionally used to sew feed sacks, or sew with heavy weight yarns through loosely woven fabric (without damaging the material). Weaver's use them to weave in loose yarns or add yarns to certain spots (http://www.theweavingloom.com/weaving-tools-the-tapestry-needle/). The bent end helps you catch the warp threads and weave a little more quickly. Use either as laying tools to help you lay a thread smoothly on your design. So whether you do cross stitch, needlepoint, or embroidery, these tools will make your stitches look better. As you make your stitch, hold the Bodkin or Bent Weaver's Needle in your other hand and stroke the thread, encouraging it to lay flat or smooth as the stitch is placed. Stroke the thread as many times as needed until the fibers look good, even, smooth, flat, etc, then complete your stitch. Use them to thread a ribbon, shoelace, elastic, or cord through a hem or seam (as in a drawstring bag). Thread your ribbon/cord/etc through the eye or slot, and let the pointed end be the forward end, easily guiding the material through the channel. Use the flat Bodkin to keep a ribbon from twisting as it is threaded through the hem/seam/channel. Both the Bodkin and Bent Weaver's Needle were invented to make stitching something easier. 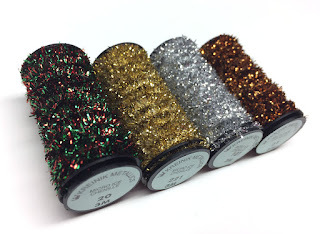 Get one of each and see how they work (Kreinik's are very inexpensive). Then take a moment on February 11 to thank the inventor's of both, plus anyone who looked at a need or problem and came up with a creative solution. If you're a stitcher, keep creating and experimenting. If you're a teacher, keep encouraging out-of-the-box thinking. If you're a tinkerer, keep tinkering. It's always good to make life better, easier, safer, and more fun, yes?